Today the Queen held her annual pre-Christmas lunch for extended Royal family members. Below, the Duke and Duchess as they arrived at Buckingham Palace. Another look at the couple as they arrive. Meghan looked radiant in ruffles for the holiday celebration! 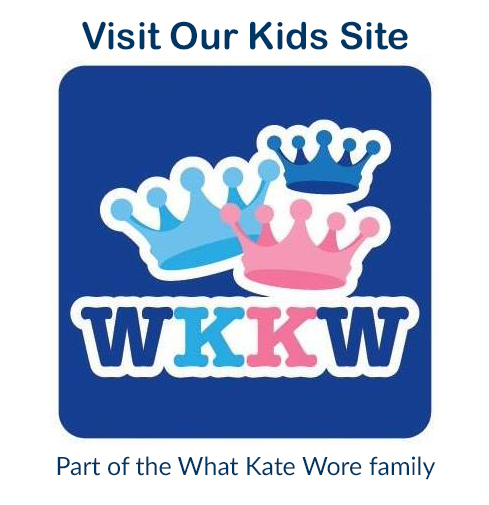 Also in attendance today were the Duke and Duchess of Cambridge, Prince George, Princess Charlotte, and Prince Louis. 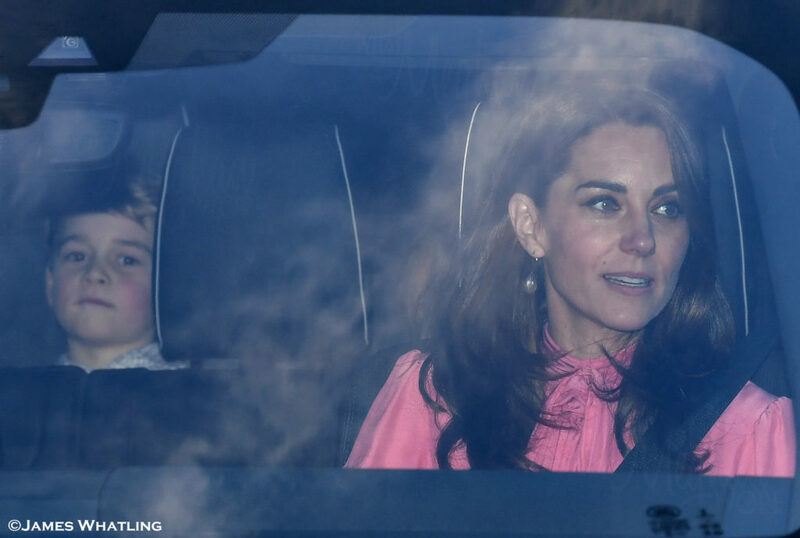 The luncheon is an opportunity for her Majesty to catch up with relatives before heading to Sandringham for the holidays where only immediate family will join her. Meghan repeated an Erdem dress she has worn previously. The dress is the ‘Devina’ style from the designer’s AW 2015 Collection in the ‘Bancroft’ purple print; it is no longer available. 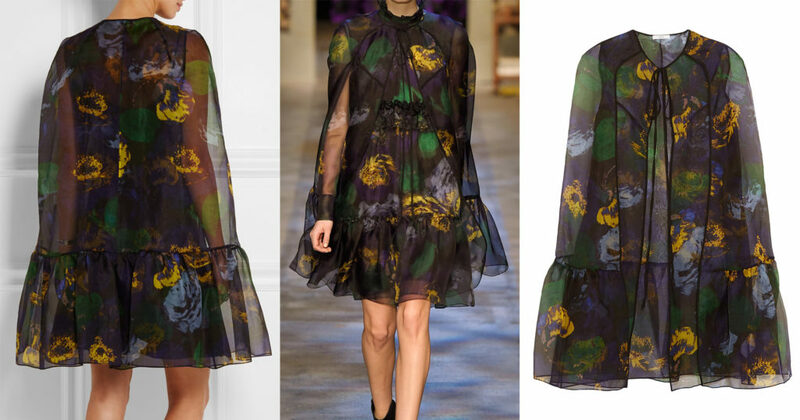 The dress is a lightweight silk organza with a frilled waistline and ruffled hem; the print is described as a floral motif in various shades. 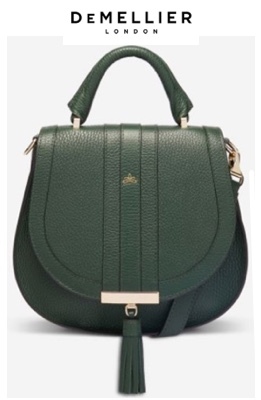 It originally retailed for $2,160. A cape, the Angela style, was also available in the same print. 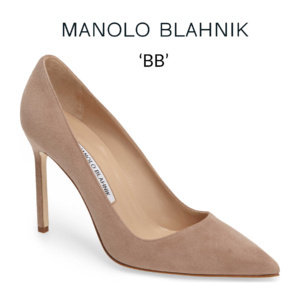 We show it below worn over the dress and as a standalone item. 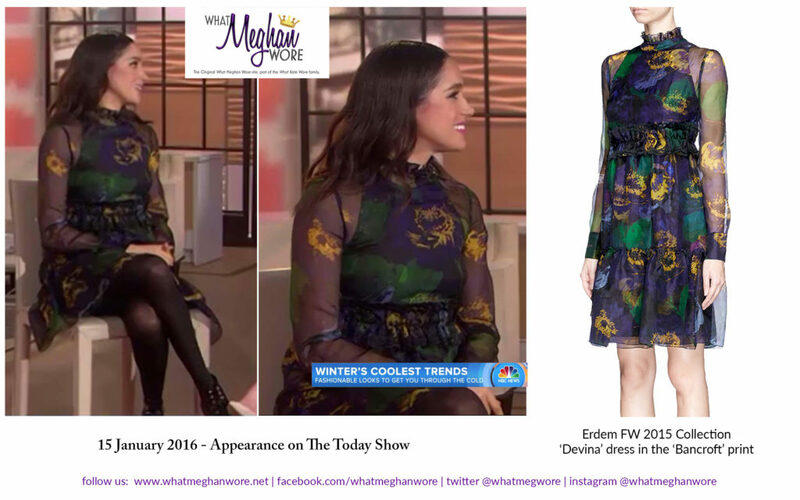 Below, Meghan when she was first seen in the dress for an appearance on the Today Show, 15 January 2016. 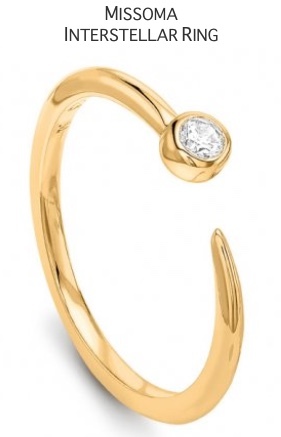 Meghan also repeated another favorite and wore her Cartier “Reflection de Cartier” white gold and diamond earrings. 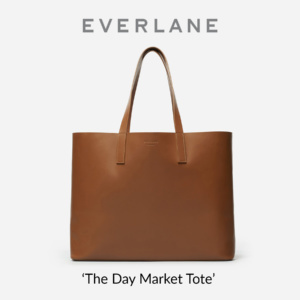 You can see the entire 2016 appearance on The Today Show in this clip as Meghan talks with Savannah Guthrie about Winter fashion trends for 2016. 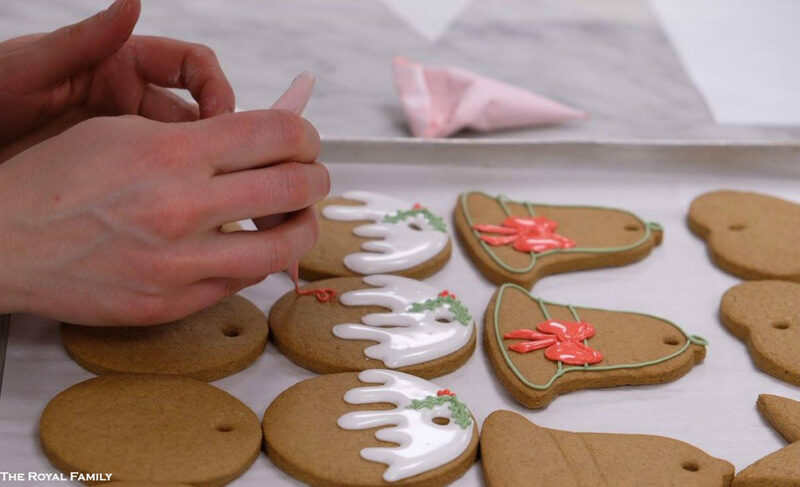 As special holiday treat, The Royal Family has been kind enough to share this Christmas Ginger Bread Biscuits recipe from Inside the Kitchens at Buckingham Palace. Please be aware that the recipe is in UK metrics format. I will provide the conversion to US measurements in an update a bit later. 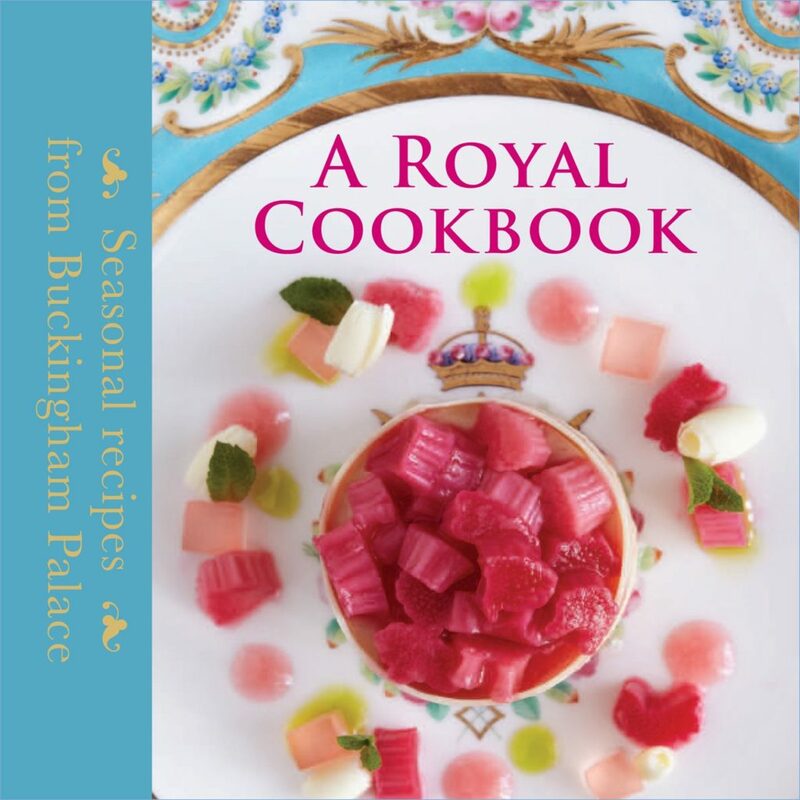 You can find additional recipes from the Palace in A Royal Cookbook: Seasonal Recipes from Buckingham Palace, Amazon US $18.52 and Waterstones UK £14.95. 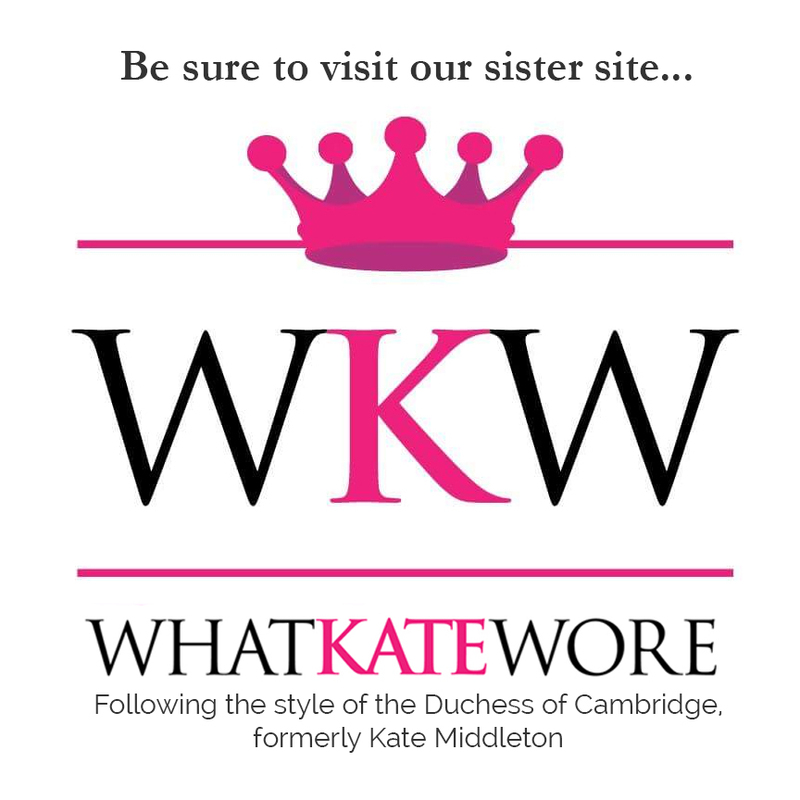 Read more on today’s event, including details about Kate’s outfit on our sister site What Kate Wore. A recipe conversion site for UK to US measurements can be found here. Can’t say I’m a fan of the dress–and like others, I’m having a hard time imagining what it must look like at this stage in her pregnancy–but there’s not accessory like that gorgeous glow. And, of course, those gorgeous earrings! She looks fantastic. The Today Show clip was fun to watch! I think it’s the most fun that the two sisters-in-law have twinned on their style picks yet again, by wearing dresses they’ve had in the wardrobe several years. It’s a simple, sweet gesture that gives the lie to some of the more ridiculous news headlines about them being generated right now. I imagine the Erdem, for all it has the unflattering gathered ruffle in the middle, is a more comfortable pick for Meghan’s maternity by virtue of being more elastic and giving her more room than the previous form-fitting Brock Collection floral dress. I also welcome her pick of something with a UK link in the label, and even better, one t hat she’s had a while. I think she’s getting her UK diplomatic dressing act together. I love the colours on her, and her straight hair is lovely, as are those earrings. She continues to glow and look wonderful. 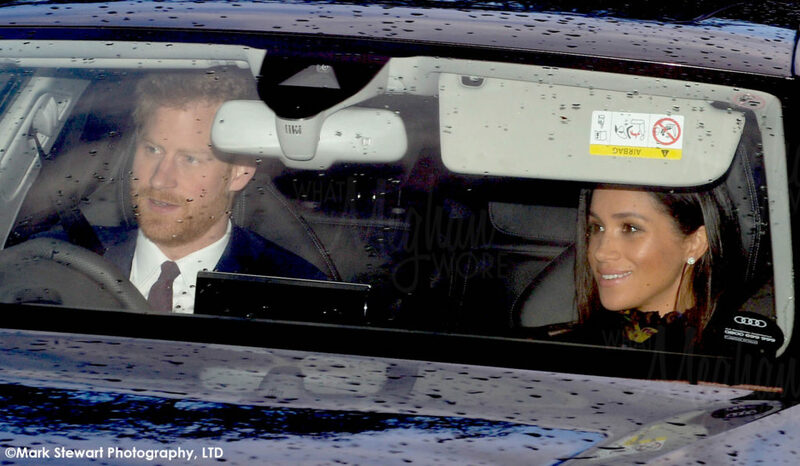 Do we have a photo of Harry driving Meghan to the luncheon in his Audi? That’s a Christmas gift for my eyes! 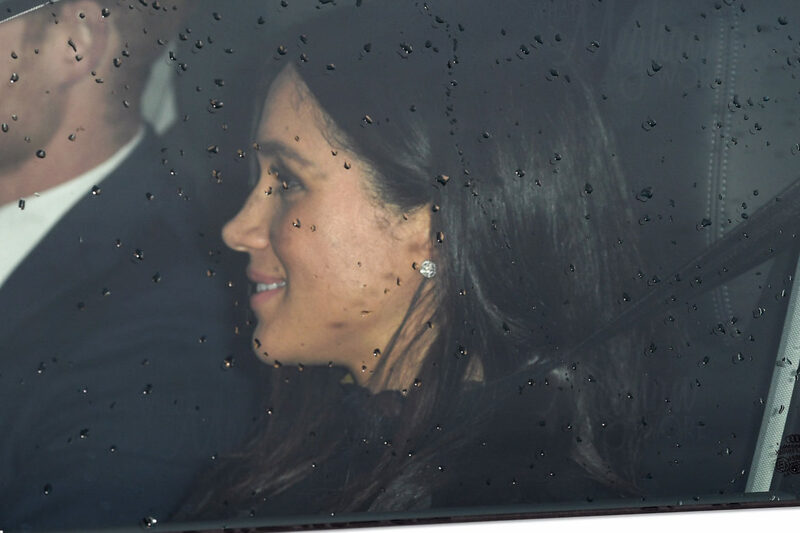 From what I can see Meghan looks beautifully radiant with her natural makeup, hair styled down, Cartier diamond earrings and happy smile. The jewel toned print on the dress – emerald, gold and blue – combined with the diaphanous overlay is stunning. I, myself, am not in a tizzy that Meghan chooses not to wear maternity fashion. As Meghan has recently noted fashion is personal and emotional and about supporting and empowering each other, especially women (paraphrase by me). Meghan is supporting and empowering women, I believe, by being photographed at work and social events with her pregnancy seen with and imbibing an attitude of whole-heartily embracing her expanding body. This might make some people uncomfortable but for others it’s a welcome change. 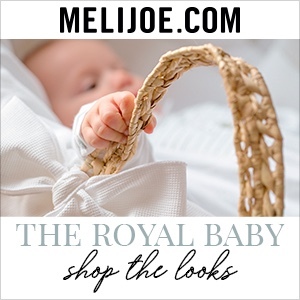 Some women, famous and otherwise, compose online blogs or journals during their pregnancy which detail all of their physical and emotional changes taking place. This seems to be very helpful for the mom-to-be and her followers who are trying to understand all of these personal developments. Some might find this over the top but for others it’s supportive and empowering. Like Diana, I was pregnant back in the 80’s. My maternity wear was donned very early in my pregnancy and was shapeless. No baby bump was ever seen in public. Working, I wasn’t asked “when will you come back to work” but, “are you coming back to work?” Good and affordable Daycare was hard to find and there was no maternity leave for dads. Things are so different now and I’m thrilled to see changes in fashion, communication, and in the work place, but -we’ve got a long way to go. Thanks for reading, I appreciate your support and feel empowered. Christiana, I don’t think the decision to not wear maternity clothes has anything to do with empowerment or support of women. There is absolutely nothing offensive about a pregnant woman. 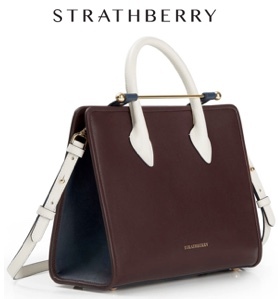 Maternity wear, however, looks/hangs so much better over an expanding body. 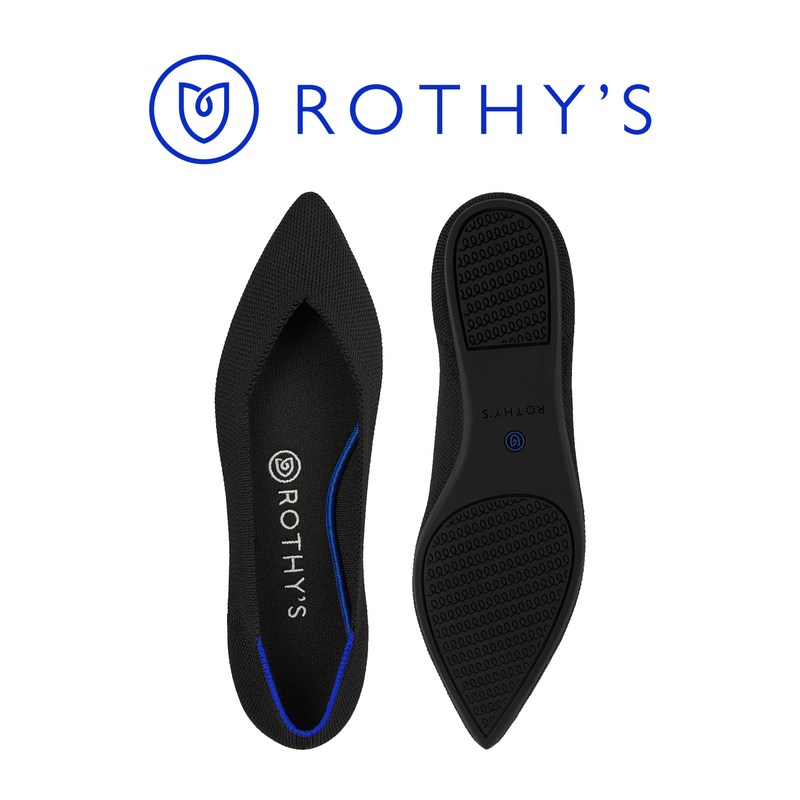 For the woman wearing it, there is more comfort and ease of movement. Hardly anyone liked Meghan’s look from the Brock Collection, when she visited Brinsworth House. It wasn’t the actual dress that people commented on, but rather how badly it fit, wrinkled, pulled and puckered. Like you, I am thrilled that today there are both maternity, and paternity leaves, affordable day care, even modern conveniences like disposable diapers. These are great steps forward in supporting women. To say, however, that wearing regular clothes that don’t fit, over stylish maternity clothes, is empowering women…well I disagree. Thank you for voicing your opinion, which I respect, and for reading my very long post! While I don’t know why Meghan isn’t wearing maternity clothes I support her decision. And yes, personally I am empowered when Meghan wears as you said, “regular clothes that don’t fit.” It’s her personal choice and to me that’s valid. Bonnie, I concur with your comments. I wore non-maternity clothing for a large part of my pregnancy but the fit altered and when my (smallish) bump made dresses indecently short, I realised it was time to invest in a few items of quality maternity wear I found that empowering. I was embracing my pregnancy and turning up to meetings looking and feeling professional and in no way apologetic for being pregnant. Squashing my changed shape into my regular clothes made me feel uncomfortable and exposed. That was my experience and I wonder with the world’s cameras on Meghan how she feels and why she is resisting maternity wear. But of course, it is her choice and I support any women to make whatever choice is right for herself. I’m a little surprised at how critical of the fit some comments have been given that we can’t see anything beyond the neckline! I understand where the thought process is coming from, but it appears the Duchess was quite slimmer pre-pregnancy in 2018 compared to her 2016 appearance on Today. I’m in no way saying that she needed to lose weight or anything like that, just an observation that she appears to have slimmed down a bit over the past couple years. 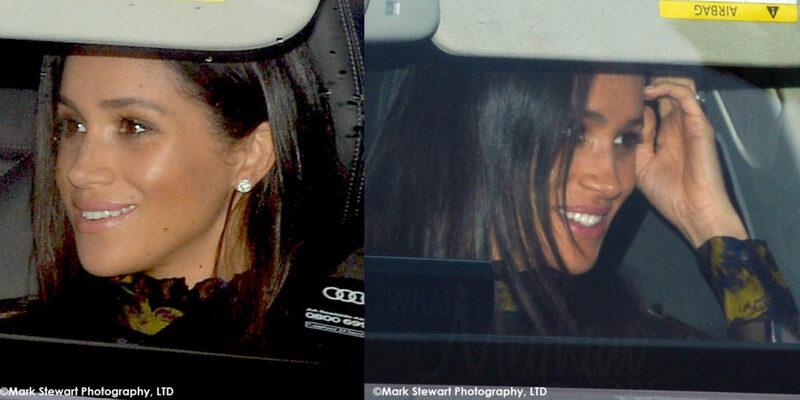 So perhaps the fit at this stage in her pregnancy isn’t as bad is some people are speculating. I think the print is lovely and, for Erdem, is quite reserved. Her hair and makeup looks quite soft and natural, and most importantly, she looks happy and healthy! Agreed! We have no idea how it fits. And like many brides-to-be, she DID seem to slim down drastically before her wedding (I don’t blame her, since she was under an incredible amount of scrutiny), so what we think is her typical size/shape was different back in 2016. Maybe the dress is a little roomier than we supposed. This is not to imply that she was in any way “heavy” in 2016. Simply very, VERY slim in 2018. Anyway, Iove the print of the Erdem, along with the high collar. It has a sort of ethereal, dark glamour. Very elegant, to go with her gorgeous glow. The print on the dress is just darling. I am not going to pretend that I can tell how the dress is fitting just from the head shot, but some major alterations would be required for it to fit comfortably. I also like the cape, not sure if she will be wearing it. I hope a good time was had by all. This is an attractive dress, worn beautifully in its first outing, but I find it hard to believe it’s a dress anyone would wear while visibly pregnant. It has that big ruffle-thing (sorry for my lack of vocabulary) around the waist – difficult to envision this working around a bump! But perhaps it’s possible to wear the waist higher up in an empire style? 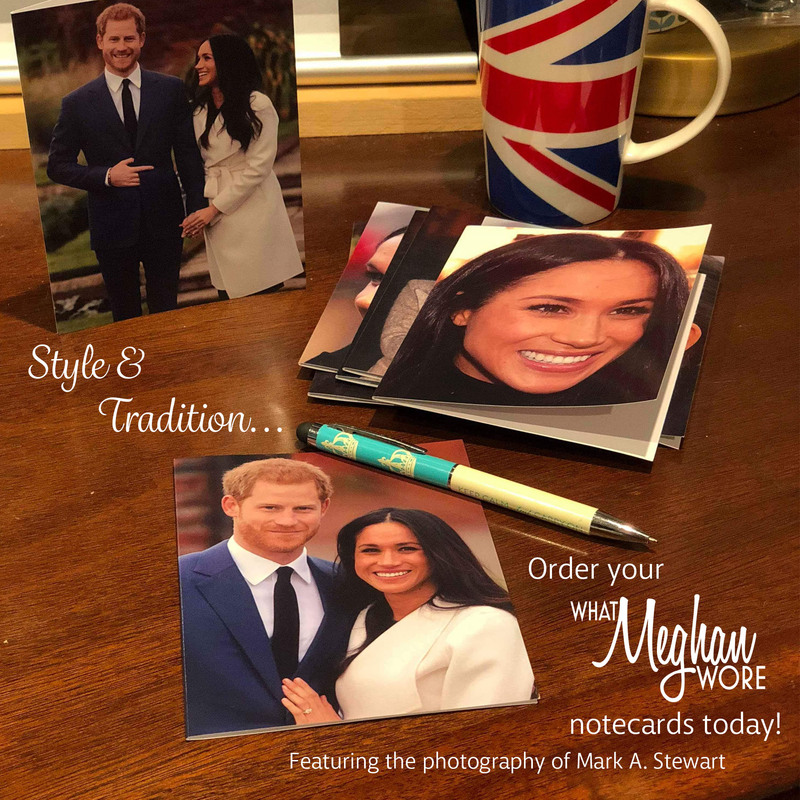 I’m very curious how Meghan made this work! Me too. I think it would be a good deal shorter this time around taking the bump into account. That would be interesting for the Queen’s lunch. This dress is okay for an Erdem, the designer many of us don’t care for. Although we can’t really see how it looks, I predict if is from 2011 it has to be very tight. 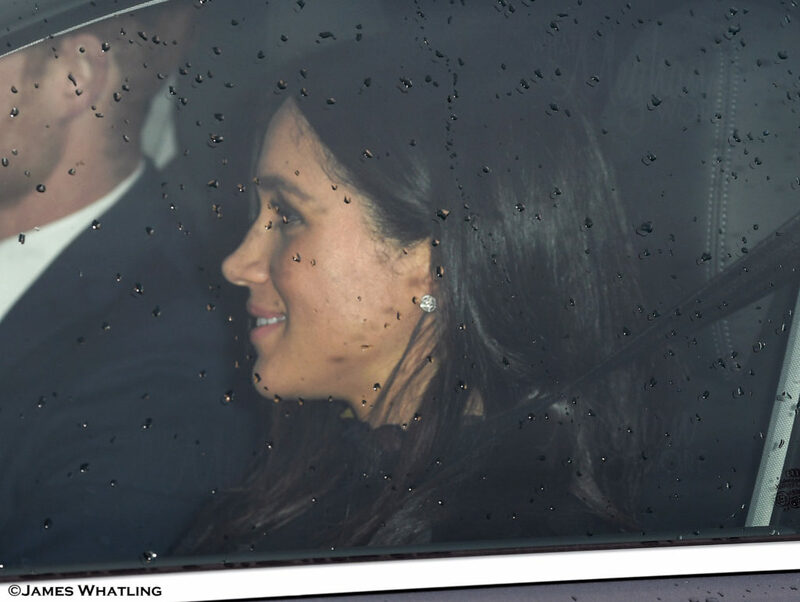 The day before Meghan was squeezed into a non maternity dress and the puckers, wrinkles and the pulling in all directions made is a very big miss. Why oh why is she not wearing maternity clothes??? We all know she is pregnant, we don’t need to see the material stretched over her bump to prove this point. If she decides to go the entire pregnancy in regular clothing we are going to see plenty of badly fitting outfits. Oops typo….2011 should be 2016. I can see how this dress would work as a maternity dress and the jewel-tones print is very pretty. I hope she wore it with the dark hose again because it seems to have a shorter hemline. The seams at the shoulders make it look like she is wearing a cami underneath, or that black bra straps are visible. I find it a bit odd. I’m guessing it will be very tight across the front considering how well it appeared to fit her in 2016. Time for maternity clothes, Meghan! Her makeup looks nice, and the earrings are beautiful. 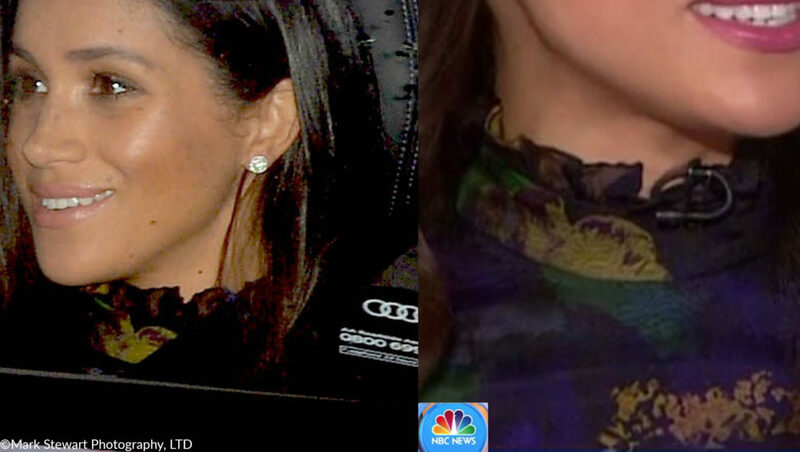 It amazes me people can identify things Kate and Meghan wear from the the very little you glimpse in these car shots. 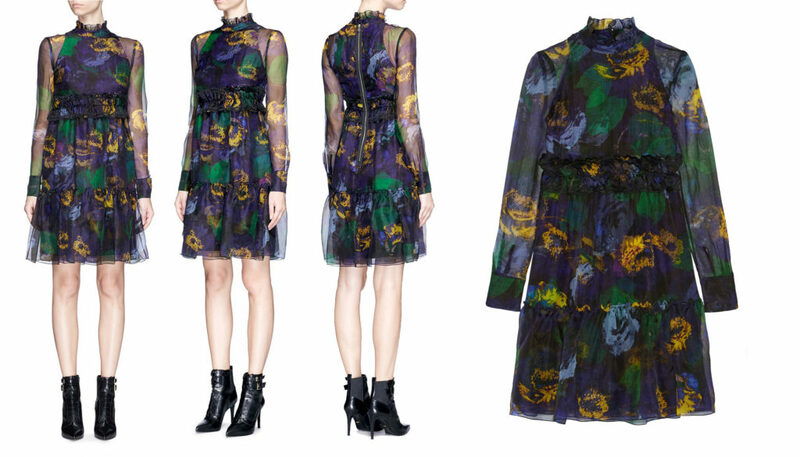 I would like the Erdem dress if it didn’t have those horrid sheer sleeves. It ruins the dress for me! The pattern is beautiful and festive but… those sleeves! It’s hard to tell how it hangs on Meghan because she is sitting but from these pictures it’s not very flattering. I’ll have to watch the video later and decide!